Share this product and receive a $3.75 sharing discount. 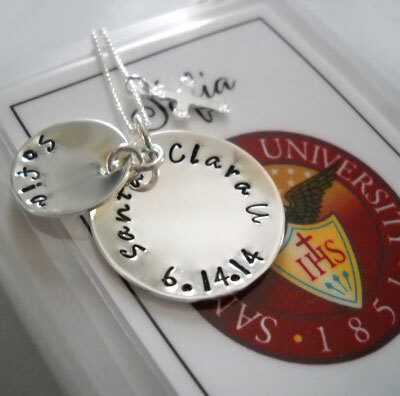 A beautiful gift for a Graduation celebration that includes the student's name, date of the event, and a the name of the College, University or Institution. Comes with a lovely card with the school's crest. This truly personalized gift will be cherished for years to come. 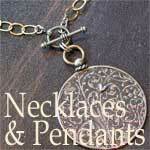 Larger sterling disc measures 7/8" while smaller disc measures 5/8" and rests perfectly on top. Comes with a 16" Sterling Silver Box Chain. Please check box if you prefer an 18" Sterling Silver Box Chain. Please select the type style that you would like for us to use. See photos below. Handwriting or Typewriter. Options to Add (for a fee): Cross, St Christopher Medal, or Ivory Mother of Pearl. Made in the USA. Please allow 3-4 business days for this item to leave our facility. Selecting Express Mail WILL NOT affect how many days it takes for us to produce this piece, but it will reduce the SHIPPING TIME.